We offer flatwork of all shapes and sizes as well as custom colors and designs! 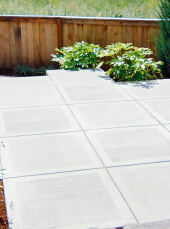 We specialize in concrete sidewalks and patios. Smooth Trowel is usually used in garage and interior floors where it is unlikely to get wet. Broomed or Brushed finish is used in an exterior area to prevent slipping or sliding when wet. Acid Etched concrete looks great with a light texture and sandy finish (not too rough, but not slippery either). Exposed Aggregate can be used inside or out and has a quality appearance while maintaining the non-skid surface. We offer 3/4 to 3/8 blend or 3/8 decorative versions. Textured Stamped is our best value for decorative concrete and has an incredibly beautiful look. Other Decorative finishes are available too...give us a call and we'll let you know what your options are! We also offer acid stain or solid stain on existing concrete! Give us a call and we will provide a free estimate based on your project details. This usually includes a site visit and free consultation on the best way to accomplish your goals.